A build up of phlegm, thick mucus produced by your infant's lungs and upper airways, can cause significant distress for your infant. There are numerous causes of increased phlegm production, such as respiratory infection, irritation, lung disease and cystic fibrosis. Garlic preparations may assist in diminishing phlegm and promote faster healing, according to the University of Maryland Medical Center. Always consult your doctor before giving your infant an herbal remedy. Garlic has a long history as a medicinal treatment, stemming back to its use in ancient Asia, Egypt and Greece. In Egypt and Greece it was most notably used among the working class to promote strength and energy in laborers. In Chinese medicine, garlic was used as a treatment to support digestion, including the treatment of worms and diarrhea. Chinese medical practitioners also prescribed this treatment to improve respiration. Garlic continued to be used in America during the 19th century as an expectorant, stimulant and tonic. Delivering the antimicrobial and expectorant benefits of garlic to your nursing infant can be as easy as ingesting a garlic supplement prior to nursing. A few drops of garlic tincture can be added to your infant's formula preparation for a similar effect. The University of Maryland Medical Center, UMMC, reports that garlic decreases phlegm production and may reduce the occurrence and duration of colds. An additional benefit of taking garlic prior to nursing your baby is that the baby may nurse longer, reports "Pediatric Research." Nasal sprays are another way of assisting your infant's breathing, clearing away mucus from the nasal passages and opening up her airway. Crush fresh garlic to produce juice and then dilute it with 10 parts water. Use a nose dropper to administer gently into the nasal passage. Not only will this solution aid in clearing your infant's breathing, but it also serves as a dose of broad-spectrum antibiotic and antiviral, reports "Medical Herbalism." UMMC recommends consulting your doctor before giving your infant garlic supplements, as there is insufficient research available on safe and effective doses. While garlic is approved by the United States Department of Agriculture as "generally safe," garlic has a number of noted side effects. 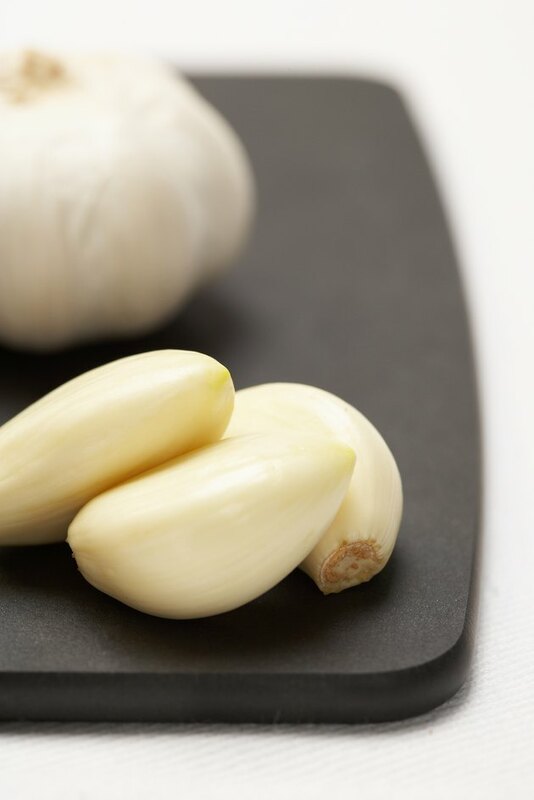 Garlic functions as a blood thinner, may cause gastric symptoms and may lead to an allergic reaction in some. Garlic is known to interact with a number of medications, such as blood thinners and nonsteroidal anti-inflammatory drugs, such as ibuprofen.